I finally reached the rank of Marshall after after almost 9 years since this system was added to bitcomet. Ranks yet to achieve are Generalissimo, and Sovereign. I know many others have reached these ranks long ago and even though I've been running these support forums for almost as long as BitComet has existed it doesn't mean I'm a huge downloader, in fact most of my activity is centered around sharing fan produced science fiction, so virtually all my activity is uploads for new releases, so growth has been sporadic. It will be interesting to see what rank everyone else is at. How long did it take you to achieve the rank of Marshall. Rank General. 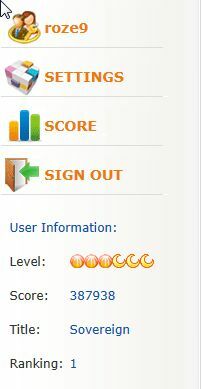 Score 99181 after 3 years. I activate BITCOMET every day in about ten years. 8 years using bit comet. Nice to meet our #1 ranked user. I was not aware the rank of 0 exists, but only two possibilities exist, someone moved ahead, or the ranking system was altered to start at 1. It's also interesting to see there are two levels you have yet to achieve, so keep up the good work and thanks for the loyalty. BitComet is my favorite application. I will continue using also in the future. In exactly 4 months from today on June 22, 2016 it will have been 10 years that I've been administrator of this forum. Prior to that I was involved with the former p2p forums where bitcomet shared space before starting our own. It's been a wild ride and nice to see so many long standing diehard Comet users. Idk if it's ok to bump this up but I almost reach Sovereign lv.2 after 7 years of being a LT seeder . Sovereign, 287451 points, rank #2014, joining date 2008-12-12. Today my points are 287571 (correct, 120 points in one day), but my rank has fallen down to #2112 from #2014 of yesterday, it is quite strange :mellow:. Can someone help me in understanding what is happening? The ranks are calculated daily I believe and will go up and down depending on others that are online. This happened before after a server hiccup when a lot of people gained a LOT of ranking but it eventually worked back to where it should have been. If I recall, the guy in the number 1 slot actually had a negative rank for a while until it all settled. What has been happening is there was an error (corrupt data or something) that miscalculated the ranking (making everyone higher than should have been the case). It will sort itself out at some stage and then the ranking numbers will start to move in the right direction again. I just reached the 3rd level of Marshall, two more and I move up to Generalissimo. Many are well beyond my rank, but I don't really do a huge amount of downloading, mostly just seed the stuff I have or grab a new tv series now n then. Of course I know this, but if you aren't downloading much, you don't have much to upload, which is why I've been doing this as long as anyone and have a very fast connection, yet many members are far ahead of me. Honestly I've paid little attention to my rank and points, but seeing from the posts of many members that it seems important to them, so this post is a chance for people to express their pride in achieving a high rank. It will likely be a couple more years before I reach the ranks of Sovereign, and who knows, there may be higher ranks released in the future, perhaps emperor, demigod, deity, or maybe they could scroll through the ancient greek or roman gods, topping off with zeus... and even though there is a small benefit for each step, it really doesn't make much difference in the real world, but it does seem to matter to bitcomet users and that is what counts. ps. Also thank you for helping other members, the forum needs more members like you.